Minimum order with your imprint, 9. Quantity variation +/- 5% is possible & billable. 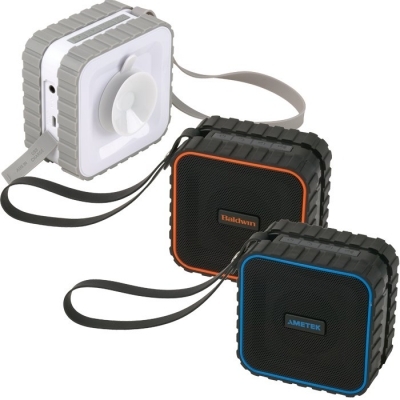 Easily attach this speaker to your windshield, glass, or filing cabinet with the suction cup. This portable and powerful Bluetooth® speaker makes a fashion statement, also. It has a remarkable sound quality, and can be used outdoors or indoors. It has the IPX4 water resistant rating. It uses the new V3.0 EDR Bluetooth® technology. Its range is 33 feet, with 5 hours of listening power in its battery. The time to recharge is only 2 hours. A micro USB cable, auxiliary cable and a written manual are included. Price includes your imprint in one location (front or back). There are 2 imprint areas. The larger one is on the back of the speaker. If we print your logo there, we would ship your speakers without the suction cup attached. Then the speaker could be used by just setting it on a desk, and not using the suction cup. Imprint Method: Pad Print or Full Color imprint.